St Anthony of Padua, a new Catholic school, has now opened on Eleventh Avenue in Austral. The vision for St Anthony's is to provide an outstanding Catholic education that will eventually cater for students from Preschool through to Year 12. It really will be a school for the 21st century! With Christ we Aspire; With Christ we Achieve; With Christ we Act. Every St Anthony of Padua student will be encouraged to take responsibility for their learning. Imagination and creativity will be treasured and nurtured. Students will have a voice in determining how they learn and they will be provided with tools to think differently and connect locally and globally. We are committed to developing strong, lasting links with our parish and the wider community. We are determined to build a culture where the community is important to the life of the school. We invite you to be part of our journey at St Anthony of Padua Catholic School as we embark on our next phase. This will be your chance to be part of something very special in the Austral area. We are now accepting enrolments for Kindergarten to Year 2, 2019 and in March 2019 we will commence taking enrolments for Year 7, 2021. 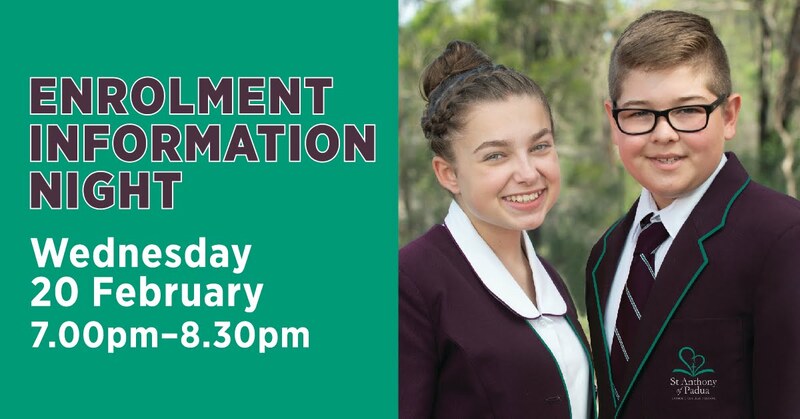 We invite parents wishing to enrol to their child at St Anthony of Padua Catholic School to contact us on the details provided or to register your interest here.